As Nigeria Super Eagles dey Seychelles for African Nations Cup qualifier wey go happun on Saturday, make I yan you some tins about one of di kontris wey fine pass for di world. I bin dey play quiz one day with my padi dem, dey feel like efiko as I just dey get all di answers. No be until one pesin ask wetin dem dey call pipo from Seychelles, na so my head just turn tabularasa. I just dey look like dondi. Plenti pipo dey wey neva hear of di kontri Seychelles tok less of to even sabi wetin dem dey call pipo from dia. E go shock you to know say Seychelles no be any obodo oyibo kontri but na one small fine kontri wey dey Africa. Dis na some tins wey you need sabi about di Republic of Seychelles. 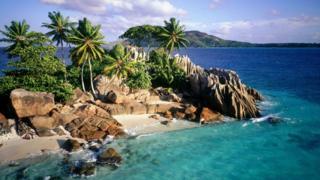 Seychelles na small group of 115 Islands wey get population of about 94,000 only - di lowest for Africa. Di East African kontri dey share border with Comoros, Madagascar, Mauritius, Mayotte and Reunion. As na Britain colonize di kontri before dem get independence for 1976, e no dey surprising say English na one of di official language for Seychelles, especially for mata wey consign bizness and goment. Before di Britain come colonize di kontri, na French di pipo dey speak and e still be one of di official language till today. But Seychellois Creole wey be creole type of French na still di main language 95% of di kontri native population dey speak. Dem dey call Seychelles kontri pipo, Seychellois. E beta make you sabi dis one now, make you no go fail am for exam like me. Tourism na di main industry wey dey bring beta moni to boost di kontri economy. Hundreds of thousands of pipo dey visit Seychelles evri year, weda na for business or to come relax dia bodi. You need any visa to travel go Seychelles but you need to hold your valid passport and oda important travel documents before dem go let you enta di kontri. Di main food wey Seychellois dey chop na fish, seafood and shellfish wey dem dey like serve with rice. Oda tins wey you fit see pipo dey chop for dis kontri na coconut and breadfruit. No dey surprised if dem serve you food with fresh flower inside your plate. Who be dis Junior Lokosa way Nigeria fit carry go Russia 2018 World Cup?